The entire financial services industry is being inundated with articles and presentations about the business implications of artificial intelligence (AI). Banks and credit unions are becoming aware of the potential of these technologies and are beginning to explore how AI could enable them to streamline operations, improve product offerings and enhance customer experiences. According to Deloitte’s white paper titled AI and You: Perceptions of Artificial Intelligence from the EMEA Financial Services Industry, AI today can be described in terms of three application domains: cognitive automation, cognitive engagement and cognitive insight. Cognitive insights: Cognitive Insights refer to the extraction of concepts and relationships from various data streams to generate personalized and relevant answers hidden within a mass of structured and unstructured data. Cognitive Insights allow to detect real time key patterns and relationships from large amount of data across multiple sources to derive deep and actionable insights. 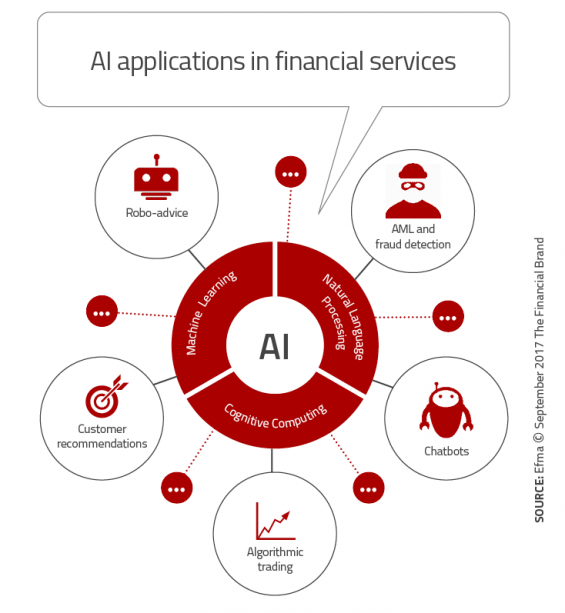 Financial services organizations realize they have a head start with the application of artificial intelligence, since they have large data sets and experience with analytical tools. From payment services to everyday banking, insight is captured that can make AI more powerful. Improving the customer experience: AI provides the opportunity for improved and faster decision making by deriving deep and actionable insights (e.g. customer behavior patterns). Some of these interactions will be with new voice or chatbot technology while other applications will be behind the scenes, supporting marketing communication. Accenture’s recent Banking Technology Vision 2017 found that more than three-quarters (78%) of bankers believe that AI will enable simpler user interfaces that will help banks create a more human-like customer experience. In addition, four out of five respondents (79%) believe that AI will revolutionize the way banks gather information and interact with customers. Finally, three-quarters (76%) believe that within three years, banks will deploy AI as their primary method for interacting with customers. As with any new endeavor, there are several challenges associated with the development and application of AI solutions. With most financial institutions in the learning phase, concerns revolve around data security, organizational impacts, the integration of new technologies and the understanding of use cases and ROI benefits. According to Efma, one of the biggest challenges is finding the right talent. With only slightly more than half of survey respondents (55%) stating they have identified an AI leader within their company, more than half of those have appointed the head of innovation as the leader. While this assignment may be fine initially, external hires will usually be required as applications get more complex. Another ‘people’ issue is the impact on current employees of financial institutions. In some cases, current employees will not be well positioned for the ‘new age of banking.’ In other cases, the transformation of labor caused by the advances of AI will eliminate some positions entirely. Alternatively, there are many who believe that automation will actually increase hiring. For instance, 91% of Efma/Deloitte survey respondents believed that new cognitive technology will either empower or support employees, rather than replace them. The potential of open banking and artificial intelligence are intertwined, making up the foundation for a new banking ecosystem that will most likely include both financial and non-financial components. By partnering with fintech providers and data analytic professionals, the power of organizational data and insights can be realized. The partnerships and structure decided upon today will determine an organization’s competitive differentiation in the future. 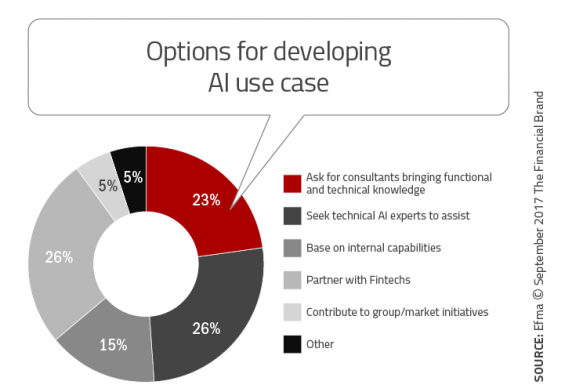 At Efma’s Operational Excellence Council meeting, it was explained that multiple providers are offering AI-based solutions and, as a result, banks need to navigate between specialist players and AI powerhouses. The goal will not to become more automated and less personalized, but to use technology and customer insights to become a lot more personalized and contextual. The banking industry is still in the early stages of developing strong AI solutions. While these solutions can definitely impact the cost and revenue structures of financial organizations, the real potential is with how artificial intelligence can improve the customer experience. Strive to maintain a human touch. Following these recommendations is a great starting point for any organization looking to respond to the increasing demands of the digital consumer. This article was originally published on September 19, 2017 . All content © 2019 by The Financial Brand and may not be reproduced by any means without permission.